The Australian Government and state and territory governments spent $6.1bn on vocational education and training (VET) in 2017, according to data from the new National VET Funding Collection published by the National Centre for Vocational Education Research (NCVER). In addition, the Australian Government Department of Education and Training provided VET Student Loans to the value of $569.7m and trade support loans to the value of $186.2m. The report Government funding of VET 2017 provides insight into the flow of funding in the public VET sector, including what activities were funded, a breakdown of funding across registered training organisations (RTOs), and the asset base for government-funded VET. “The new National VET Funding Collection comprises all funding provided by state, territory and Australian government VET portfolios to stimulate or support training places and outcomes,” said Simon Walker, Managing Director, NCVER. “It is designed to provide us with a more complete picture of how government funding flows through the sector. The states, territories and the Commonwealth spent $6.1bn on VET in 2017, including $4.6bn for VET delivery, $614.5m for employer assistance, $71.9m for supporting students in their studies (including equipment and travel, completion incentives, and wrap-around support services), $219.8m for capital upgrades, and $610.8m on system administration and governance. In terms of support for training, public RTOs received $3.4bn and private RTOs $1.2bn to deliver VET, with the states, territories and the Australian Government holding $10.5bn in assets to support the public VET system. 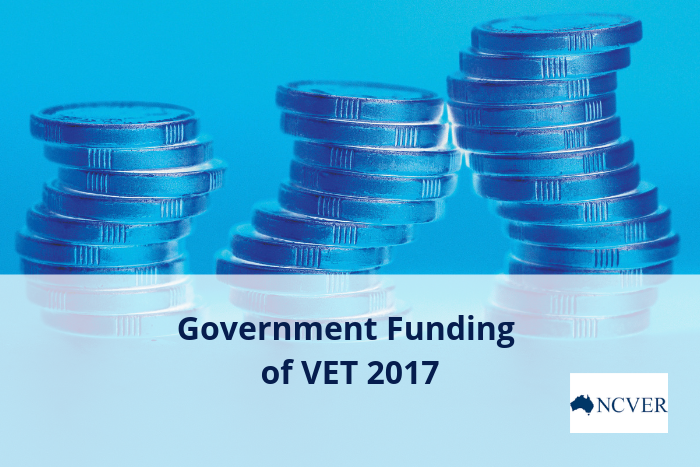 The full report Government funding of VET 2017 and support documents are available on the NCVER website. A second stage report providing further detail on government expenditure on training in 2017 is scheduled for release in February 2019. The new National VET Funding Collection will replace the National VET Finance Collection and will be gradually phased in over three years, with full implementation for the 2019 reporting year. Therefore, VET financial data will not be collected from 2018 onward.